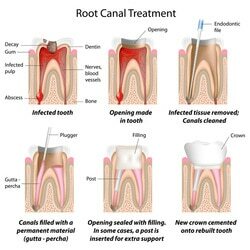 Root canal therapy is the process of removing the “pulp” of a tooth – matter comprised of nerves, blood vessels and other living tissue – when it has become so damaged or infected that leaving it would result in the loss of the tooth and a more serious, systemic infection. The term “root canal” refers to the hollows inside the roots and crown of a tooth where this pulp resides. Endodontic therapy usually becomes necessary when a tooth has either been traumatized by injury or when decay has damaged a tooth so badly that it has reached the pulp chamber and infected the tissue. 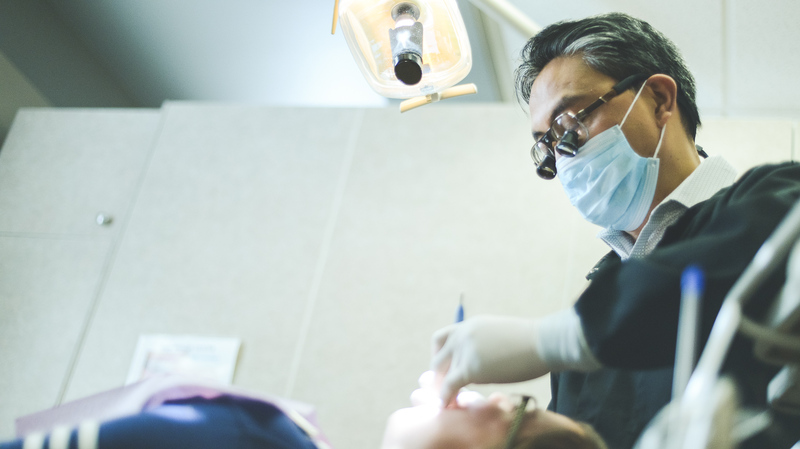 Depending on the level of complexity, root canal therapy can be performed by either your general dentist or an endodontist, a provider who specializes in this procedure. The patient is first numbed using a local anesthetic. Access to the pulp is achieved by creating a small hole in the crown of the tooth, and the infected tissue is then cleared out using a series of drills and files. Afterwards, the hollows of the tooth are cleaned and decontaminated. A series of files, gradually increasing in size, are used to widen and shape these canals to prepare them for restoration. This part of the process can take multiple appointments, as the dentist needs time to ensure that the infection doesn’t return after removal. AH, THE DREADED ROOT CANAL . MOST OF US HAVE HEARD OF ITS HORRORS – WHAT FEWER KNOW IS THAT, WITH TODAY’S TECHNOLOGICAL ADVANCEMENT, ROOT CANAL THERAPY (KNOWN AS ENDODONTIC THERAPY) IS OFTEN A COMPLETELY PAINLESS AND HIGHLY SUCCESSFUL SET OF PROCEDURES THAT CAN SAVE YOUR NATURAL TOOTH. THERE’S NO NEED TO FEAR! Once the area is officially clean and infection-free, the hollows are filled with inert material, most commonly gutta percha, a natural polymer made from latex from the Percha tree. This helps to prevent future infections. Depending on the condition of the tooth, a final restoration of either a filling or a crown will then be placed. After successful completion of endodontic therapy, the tooth is considered officially “dead,” as all the nerve tissue has been removed. Given this, teeth with root canals are more brittle than natural teeth. Care should be taken to avoid fracture or further damage to the tooth. Saving the outer structure and roots of the tooth, however, is usually preferable to losing the tooth altogether, and a root canal will do just that in many cases. You can expect to be numb for a few hours following your procedure. Due to this numbness, drinking and eating may be difficult in the affected area. Avoid drinking anything very hot or chewing as you might hurt yourself without realizing it. Since the nerve was removed, sensation for that particular tooth will be diminished or absent. However, sensitivity or soreness is normal following the procedure due to the manipulation of the surrounding tissues and probable infection in the bone from the diseased nerve. This usually abates in a couple of weeks but could last as long as six. If your sensitivity worsens, does not subside or you are in pain, call your dentist to schedule a follow up so they can make sure the infection is gone. Swelling can happen following root canal therapy. Swelling can be a symptom of a more serious issue or remaining infection. To be safe, call your dentist immediately if swelling is present. Teeth that have undergone root canal therapy are more brittle due to the lack of blood supply and must be protected accordingly. For posterior teeth, or teeth missing a lot of their original structure, our office recommends placing a crown to strengthen the tooth and prevent further trauma. Think of this a your way of protecting your investment!